LENCO transmissions are a planetary design. Uses special cut monster 2" gear sets in forward low gear case. Second gear set case, in the event of 3 or 4 speed applications, utilizes standard sized 1" gear. The CS1N case is slightly larger than standard CS1 at a 9" diameter and a 9 1/4" length. CS2 design is engineered for race cars producing up to 2500 HP. The CS2 is a smaller and lighter version of the CS1, planetary gear size is 3/4". 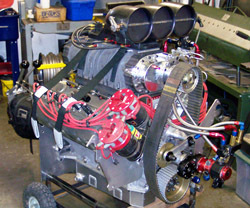 The very compact CS3 is engineered for cars producing up to 1800HP and weighing up to 2700 pounds. Standard planetary gear size is 1/2". The Sprag clutch is utilized in each shiftable section of the LENCO with the exception of the reverse. Its used to force the gear set to make it's ratio by preventing the sun gear from rotating in one direction. When this same section is shifted the Sprag then allows the sun gear to rotate in the same direction as the crankshaft. Small sprag width is .803"
Large sprag width is .980"
To set the shift pressure install checking lever into tower screw jam nut all the way up the tower so it's out of the way. Now rotate tower clockwise until it lightly touches pin on shift fork then rotate tower counter clockwise 2 turns and place hook of scale in top hole of checking lever supplied with transmission (this lever should be about 5 1/2" over all length) and pull scale slowly to shift section, taking note of highest reading this is your shift pressure. If the shift pressure is set to your application lock the jam nut your finished, if not you then need to add shim to raise pressure or subtract shim to reduce pressure. If needed you may vary 1 full turn up or down from your 2 turns out in order to achieve the shift pressure desired. There are two different size air servos for the New Generation transmissions. The small air servo (2.5"piston diameter) and the large air servo(3"piston diameter) for the CS-2 large case transmission and Lencodrives. The air servo is attached to a rotary shift plate by an adjustable arm which is pre-set by the factory and should NOT be changed. The arm is held into the servo piston by a set screw. Run the air servo jam nut and o-ring up the threads on the servo. Screw air servo into case until it bottoms out against the jam nut. Rotate air servo into case until you see the set screw in the air servo piston boss inside the case. Apply a small amount of Red (271) Locktite on the set screw. After inserting arm into the air servo piston boss, run set screw in until you can no longer remove the arm from the piston boss. Warning: Do Not over tighten set screw. The arm must be free to move in all directions. Screw air servo counter-clockwise about five or six turns before you reassemble the transmission. Assemble next section on to case and bolt tight. Std o/p shaft 3.5" pro shaft 4.5"